What are some of the top things we learned for fantasy football in Week 14 of the 2018 NFL season? Fantasy football is an ever-changing game, and what we thought was a sure thing a few weeks among might not ring true anymore. Below are seven things we learned from Week 14 of the 2018 fantasy football season. Through Sunday night, Brady is the overall QB1 in Week 14, while Gronkowski is the TE2. Brady dropped 358 yards, three touchdowns and no interceptions against the Dolphins, while Gronk caught all eight balls thrown his way for 107 yards and a score. The duo has now hooked up for a touchdown in two of their last three games, something that hadn’t happened since Week 1. There’s a good chance you survived the regular season with Brady as your quarterback, although your playoff odds aren’t quite as good if you had Gronkowski. Either way, the Brady/Gronk hookup is heating up down the stretch, which bodes well for the rest of your fantasy playoff prospects and puts them back on the map in DFS. 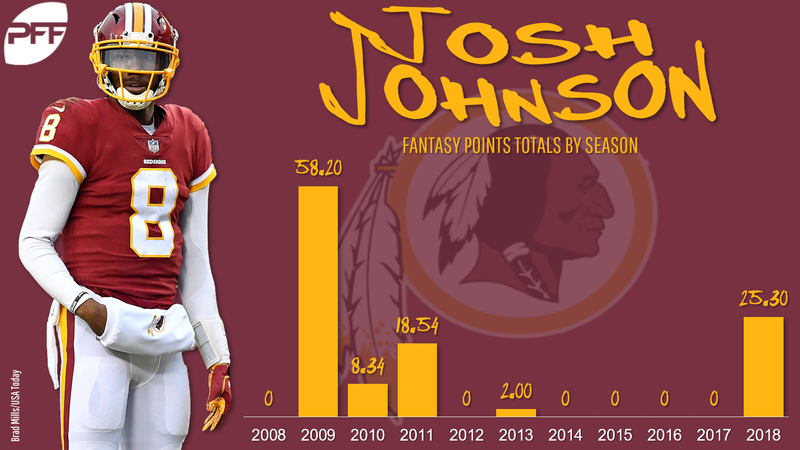 Johnson entered the Redskins-Giants blowout about halfway through the third quarter. And in about 20 minutes of game play, he ended with 25.3 fantasy points — third-most among all quarterbacks so far this week. He threw for 195 yards and a score, but importantly (for fantasy), he added 45 yards and a rushing touchdown as well. The game was already over by the time Johnson entered the game, so he likely benefited from softer-than-usual defense, but his rushing ability does put him on the map in 2QB leagues. And that’s even with tough matchups against the Jaguars and Titans on tap. 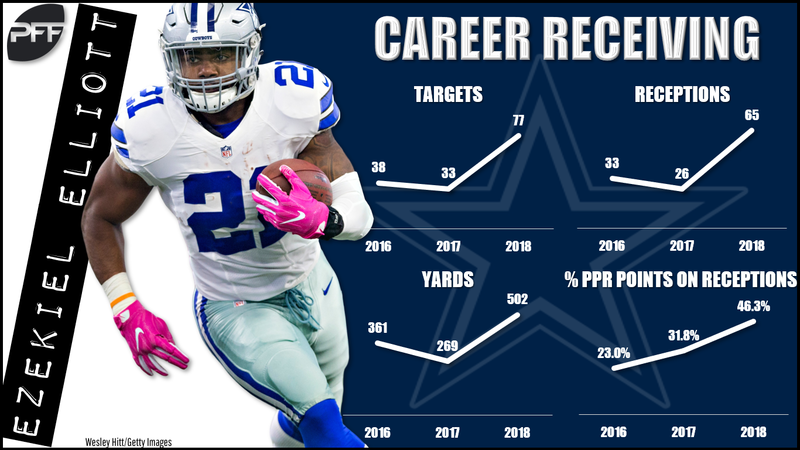 Elliott has been a good receiving back so far this year — especially since the team’s bye. Over the last six weeks, Elliott has caught 40 balls (nearly seven per game). He blew away all season- and career-bests this week with 12 receptions. He’s obviously not going to catch that many passes every week, but those totals were never in Elliott’s possible range of outcomes. They are now, and it’s finally time to view Elliott as an all-around elite running back (not just on the ground). Samuels led Pittsburgh’s backfield with 11 rushing attempts to Ridley’s five, but Ridley got the valuable goal-line carry (which resulted in a touchdown). For those in PPR leagues, though, Samuels salvaged the day with seven receptions (on seven targets) for 64 yards. So what did we learn of value? With James Conner shaky for Week 15, we know we can lean on Samuels again in PPR leagues but he’s not the best play in standard formats. Ridley can be safely avoided everywhere. Cooper simply took over the Dallas/Philadelphia game in the second half, as he finished with 10 receptions for 217 yards and three touchdowns (on 13 targets). The 13 targets were elite — tied for second-most among all wideouts this week — and the 10 receptions, 217 yards, and three touchdowns are obviously as good as it gets. Cooper has a touchdown and/or 75-plus yards in four of six games with the Cowboys. He now has at least eight receptions in three straight games. He’s reached his ceiling in two of his last three. He’s an elite fantasy receiver again. Everyone was fixated on Courtland Sutton in Week 14, but it was Patrick and Hamilton who stepped up in a big way with Emmanuel Sanders injured. Hamilton caught seven of nine targets for 47 yards and a touchdown. Patrick caught seven of 10 balls for 85 yards. For Hamilton, the yardage is obviously low for that many receptions (just 6.7 YPR), but the high volume puts him on the map in DFS. Patrick paced the team in targets and gained more yards (12.1 YPR), which also puts him on the radar. Sutton isn’t useless — he should still lead the team in receiving over the final three weeks — but it’s clear that not everything is going to funnel through him. Thomas was trending toward tail-end TE1 territory prior to Week 14, but he showed that he does belong in the conversation — at least as a strong streaming option. His 11 targets were most among all tight ends this week, as were his nine receptions. The rookie gained a season-high 77 yards, and even though he has yet to score this season, it’s clear he’s going to be a big part of this passing offense as long as Greg Olsen is sidelined (and in future seasons).